There are two major types of variable frequency drive on the market: mechanical and electrical. Variable pitch drive – a belt and pulley drive where the pitch diameter of one or both pulleys is adjustable, giving a multi ratio and hence a variable output speed. Traction drive – the diameter of the contact path of two mating metal rollers is adjustable, giving a multi ratio hence a variable output speed. Hydraulic hydrostatic drive - a positive displacement hydraulic pump and motor where the volumetric fluid output of the pump is varied through valves or by varying the displacement. Hydraulic hydrodynamic drive or fluid coupling – two impellors coupled together with hydraulic fluid. By varying the volume of the fluid the degree of coupling from primary to output can be varied and therefore variable speed obtained. Hydraulic hydro viscous drive – a number of discs on the input shaft pressed against a corresponding number of discs on the output shaft. There is a film of oil between the discs. By varying the pressure squeezing the discs together the torque transfer can be varied hence realizing variable speed operation. The most common mechanical VFD used within industry is the fluid coupling. Eddy current coupling – located between the fixed speed motor and the driven machine. It consists of a fixed speed rotor and a variable speed rotor separated by a small air gap. An excitation winding is provided on one of the rotors to develop a magnetic field that couples the rotors together and determines the torque transmitted. Similarly, with the fluid coupling and the hydro-viscous drive the efficiency of these VFDs is proportional to (1-S). Thus as the speed difference between the rotors increases the efficiency decreases. DC drives and corresponding dc motor: the dc converter converts the supply ac power into a variable magnitude dc voltage that is supplied to the armature winding of the dc motor. A similar conversion process is used to provide a variable magnitude dc voltage to the shunt field winding. Normally the field current is kept constant for motor speeds below the base speed of the motor while the armature current is varied to control the torque output of the dc motor. 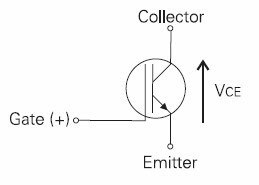 The VFD can be made fully regenerative if it possesses two anti-parallel rectifier bridges. Dc drives normally make use of thyristor technology and can be used for all applications listed above that are in nonhazardous areas. From a power network perspective dc drives operate at a power factor that decreases with a decrease in motor speed and injects harmonic currents that are roughly proportional to1/n in magnitude where n = 6k±1 and k = 1,2,3… if full wave bridges are used. 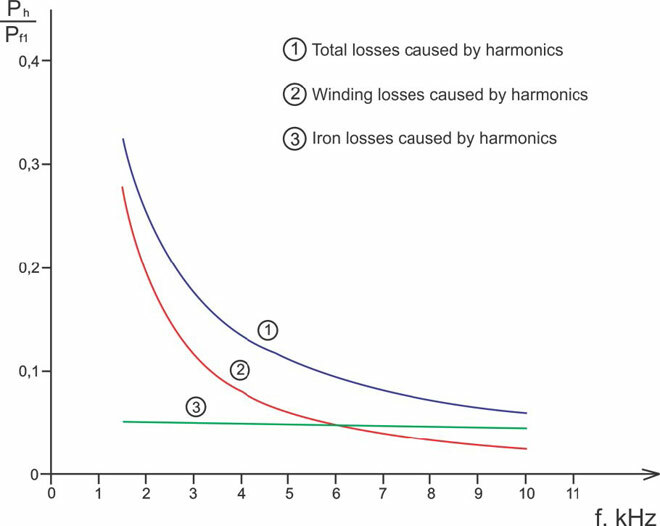 Harmonic mitigation can be effected by using 12, 18, 24, or 36 pulse systems, by using multiple six-pulse bridges in parallel or series, and where each bridge is supplied from a suitable separate secondary on a phase shifting converter transformer. Direct conversion: This type includes cyclo-converters and other matrix topologies where the input ac power is converted to variable ac power in one stage. The most common of these VFDs is the cyclo-converter controlling a synchronous motor with brushed or brushless excitation. These VFDs are used in applications where the motor speeds are low and the torque requirements are high. Examples of these applications are ship propulsion VFDs for the main screws, metal rolling mill VFDs, ore grinding mills and mine winders.The biggest negative feature of these VFDs is the large harmonic currents that flow in the motor circuit and more particularly into the network. At present, cyclo-converters are based on thyristor technologies, but as more research is done on matrix converters using bi-directional switches and new techniques are developed to reduce the harmonic generation,the popularity of these types of VFDs might increase. Current source: This type of VFD is a two stage conversion. First,the incoming ac power is converted to an intermediate dc current in the dc link reactor. The magnitude of this current is regulated to match the required motor current to ensure the requisite torque output. The second stage is the output inverter which switches the intermediate dc current to each of the phases of the motor as required. Both the converter and inverter are fully regenerative. A current source VFD controlling a synchronous motor is also known as a Load Commutated Inverter (LCI) VFD and usually makes use of thyristor technology. 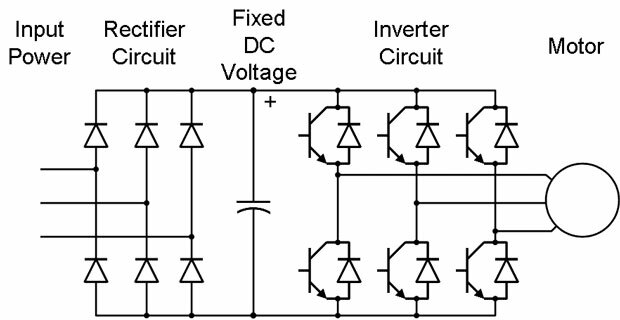 Thus from the power network perspective, the LCI VFD behaves in a similar fashion to a dc drive with its inherent power factor and harmonic current injection characteristics. The VFD performance is not very dynamic when compared to other ac or dc drives as current is forced into the large inductance in the intermediate link and is therefore only suitable with fan and pump type loads. This VFD also suffers from torque pulsations due to the square wave current shape and the control philosophy used when operated at frequencies below 8 Hz. Open loop or frequency control: In this algorithm, the controlling variables are motor voltage and inverter output frequency. The motor voltage is controlled to be a linear function of the output frequency for most of the speed range in an attempt to keep the motor flux constant. 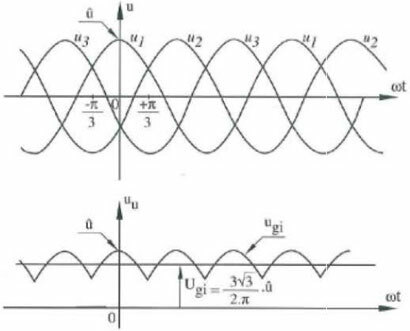 Both these reference parameters are fed into a pulse width modulator to generate the pulse trains that are supplied to the motor stator windings. Significantly, this control method does not make use of any feedback from the motor shaft such as speed or position within the control loop and therefore torque cannot be controlled with any degree of accuracy. This type of VFD is suitable for any application that is non-dynamic and does not require high levels of accuracy or precision. It is for use with ac asynchronous induction motors. Flux vector control: In this algorithm the spatial angular position and speed of the rotor flux, relative to the stator, needs to be known. Thus a feedback device such as a pulse encoder is connected to the motor shaft. Through a mathematical model within the control software in the VFD, the measured phase currents and rotor speed are used to calculate the control variables of voltage and frequency for the pulse width modulator. The modulator generates the pulse trains that are supplied to the motor stator windings. 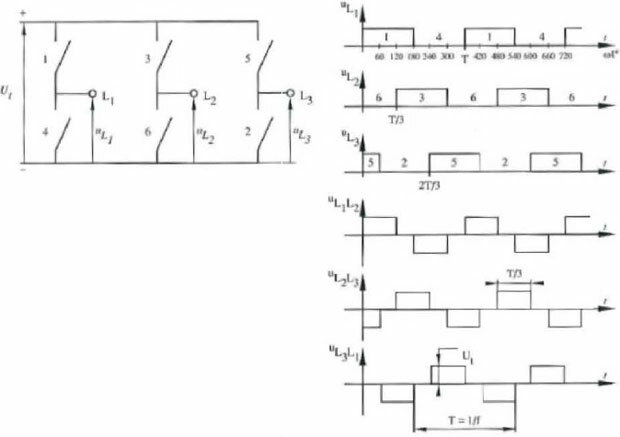 This control algorithm is a major improvement on the open loop control as there is a good torque response, accurate speed control, full torque at zero speed, and performance approaching a dc drive. The flux vector VFD is suitable for any application where ultimate performance is not required.It is for use with ac asynchronous induction motors. Direct Torque Control (DTC): In this algorithm the measured phase currents and phase voltages are used in the mathematical adaptive motor model within the control software in the VFD to calculate the motor speed, torque, and flux in the motor. This motor model is critical to the success and low motor speed performance of the algorithm. The torque and flux are compared with the torque reference and flux reference respectively every 25 microseconds to generate status signals. These status signals are calculated using a two level hysteresis control method and become the inputs of the optimum pulse selector, which generates the pulses that are supplied to the motor stator windings. This high speed of switching is fundamental to the success and performance of Direct Torque Control. Thus no measured speed signal or a pulse width modulator is required.This type of VFD is used with ac asynchronous induction motors and, with alternate software, is also able to control asynchronous motors. The most common electrical VFD used in industry today is the ac variable frequency drive using Voltage Source Inverter (VSI) typology and controlling asynchronous squirrel cage motors, most common applications are VFD for pumps and fans.